The documentary BLACK DEUTSCHLAND (Black Germany) of 2006 is an intimate study about the feelings and the thoughts of a not so small minority - black Germans and black people in Germany. The director Oliver Hardt portrays five individuals engaged in the cultural sector. Noah Sow (woman in train): I think that as long as there is a basic consensus in a society that you can talk about people who or not white, as if they are not part of the society, or if you be mean to them, or ridicule them, then you are creating an important basis for violent forms of racism. Images of East Germans screaming: "Germany for Germans, foreigners out". The photo of Sam Meffire entitled "ein sachse" ("A Saxon") . It refers to Saxon, a state of Germany located in former East Germany. Sam Meffire was born in Saxon. Sam: I wanted to show my face to show my position. It was a roof to say what you are doing is wrong, what you tolerate is wrong. East German Girl. It shouldn't have been done this way, but I am glad they [the foreigners] are gone. Sam. The limit has been reached what we can endure, what I can endure. US-American writer, born in New Jersey, lives and works in Berlin. Author of Negrophobia and That's Blaxploitation!!! 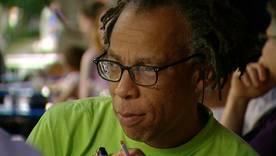 "One of the things I was very much interested in when I moved here was the diversity of black people in Europe. In the United States, or at least in the Northeast, there is this monolithic idea of black identity in terms of how you define a black person, a notion that is completely false, erroneous, not true. Black people come from everywhere. And they are everywhere." "What you still can see here in Germany is blacks being put into certain roles, in TV series or films, or in advertising too. Then it's always somebody who either desperately needs help and is starving to death – your classic African, for example – or a refugee or a drug dealer, or the newest is a famous DJ or a good female singer or something like that. But that just plain normal people can also be black, the way it is in Germany's real world, that you don't see at all in the media." Violence was an everyday thing for me. And I was both receiver and giver from the very beginning. Maybe that's part of the disaster, that it was such an everyday thing, from the very beginning." Born in Cameroon, barkeeper, studying journalism and history in Berlin where he lives since 20 years. "The image that people are used to seeing of Africans and Africa is exactly this image full of prejudices. There are these characteristics: blacks are lazy, uneducated and uncivilized. This image leads to people being afraid. Only after they have been forced to get to know one do they start, little by little, to correct this image in their mind. But as a black person you always have to first fight with this image." Actor, musician and producer, born in Austria, raised in Germany. "I think the term Afro-German is very important right now, not so much to distinguish oneself from other communities but to become aware that you can be black and still be a German. And to be able to feel German because that's not yet possible. If you look at France, at England, you see that different communities may not always understand one another or like one another, but a black French person is still French. A black English person is still English. 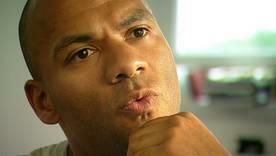 But in Germany it's really the case that as a black person, who's German, you´re still referred to as a foreigner." 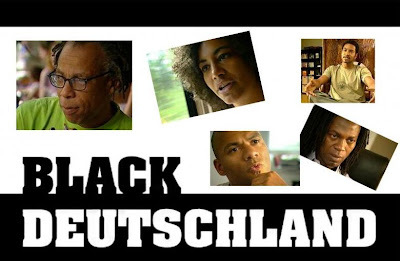 See the post on Afro-Europe "Being Black in Germany"